This savvy entrepreneur got her hands on some leather and grommets thre years ago, when she launched Jenna Kator Collection. The recession hit the country hard and none felt it harder than Detroit auto industrialists. While many sat at home collecting unemployment checks, Kator got to work making her dreams come true. Being a true Michigander, Kator found inspiration in her own back yard. As unique as the two coasts of the United States are, so are the two coasts of Michigan. This is shown in every detail of Kator’s bags. You won’t find any of Jenna’s bags in a large chain store, or with a hefty price tag either. One of the most exciting things about Kator’s bags is that not only can you purchase them online, but also you can go to 28 local boutiques and shops in Michigan, including Mackinac Island (There’s one in Indiana, as well!). All of the bags and accessories run under $100. You also have the opportunity to meet Kator, by appointment, in her Royal Oak showroom or at one of her many trunk shows. Kator does more than just make handbags; she’s also a philanthropist. A special handbag has been created in collaboration with Taylor Clark, a student from Sterling Heights, in which all of the profits are being donated to the Gift of Life Foundation, a Michigan organ and tissue donation program. Kator has also teamed up with Handbags of Hope who provide local domestic violence shelters with the necessities to make life easier. Kator’s shown that even when times are tough and everyone says you can’t, you can. She’s an inspiration to every ambitious artist and entrepreneur. So go out there and support your local artists and designers. 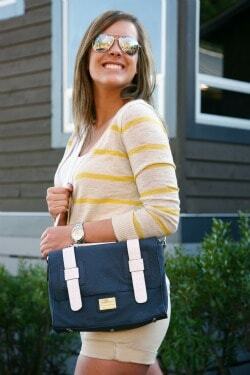 Buy a Michigan-designed and inspired Jenna Kator handbag!